For the second day of cooking with Capsicum under 1 Vegetable 3 dishes, I have a Capsicum Coconut Curry. This has been in the draft for so long that I almost forgot about it. I picked up capsicum only for this draft and wanted to make different varieties. A few months ago, we ended up picking capsicum every time we did vegetable shopping. So we always had this stocked. 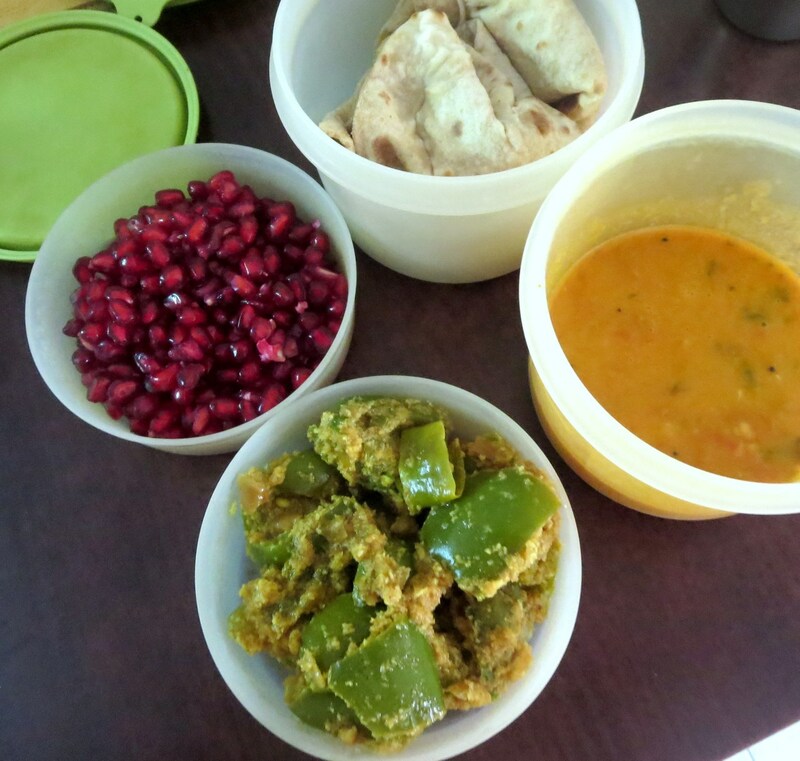 One of the occasions, when I was wondering what else to make, Amma suggested this recipe that she saw in a Telugu TV show. she made a note because it was so different from the usual way we make capsicum. Later I was even surprised when Pavani had made the same. Imagine she posted this way back in 2014, I really can’t believe it! Anyway, we have made this couple of times, only I never came around posting this. It’s been a while since I shared my lunchbox, though I seem to have reached 83 in the series. I know sometimes I don’t get time to actually click the packed box. I hope I get to do better in that area! Heat oil in a nonstick pan, add the cumin and mustard seeds and once the seeds start to splutter, add the green chilies and ginger garlic paste. Cook for 1 min. Add the capsicum pieces, salt, and some water. Cover and cook till the pieces are tender. Add the fresh ground coriander powder, mix well and cook for another 2 minutes. Serve with rice or roti. Check out the Blogging Marathon page for the other Blogging Marathoners doing this BM This goes for the June Week 2, Cooking from Cookbook Challenge Group. That is a perfect dish for lunch boxes! 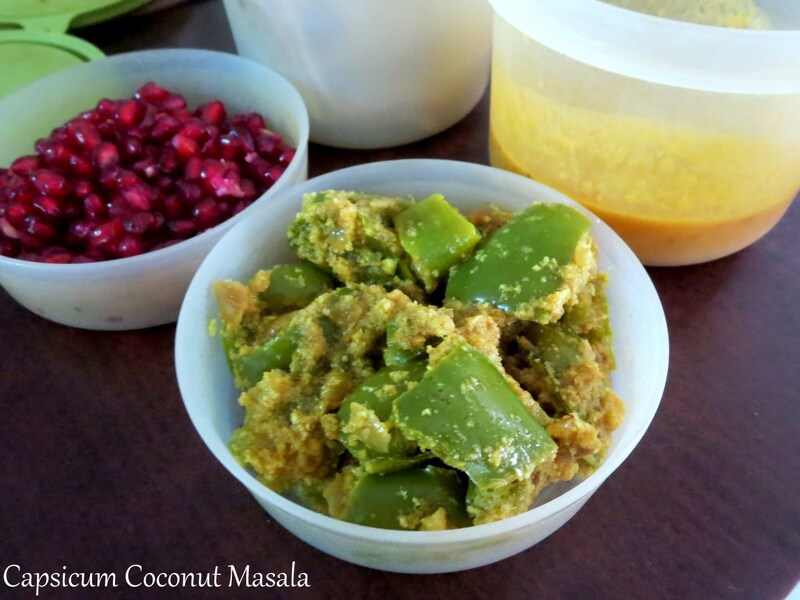 Great way to make capsicum with coconuts. 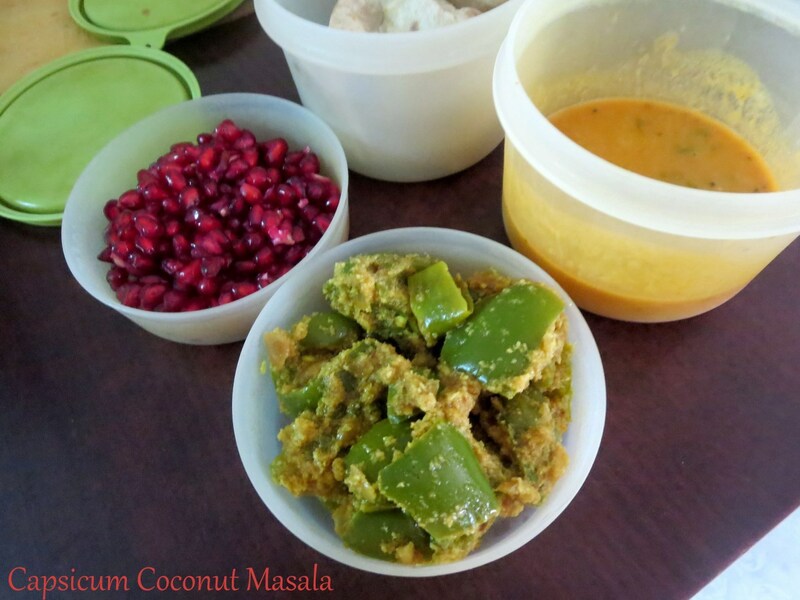 I love capsicum curries and coconut masala curry looks flavorful. Sounds like an interesting masala, love to enjoy with some rice and rotis. Sounds good. Definitely different from the regular stuff we end up with capsicum in my place. Simple curry. Perfect with roti! For some reason the dish seemed familiar until I read that I made it myself 🙂 It is indeed an interesting combination. I have never used coconut with bell peppers. Looks delicious. Must try sometime.